Unlock Democracy's Director, Alexandra Runswick, speaks to the Fair Vote Now rally about why getting big money out of politics matters. 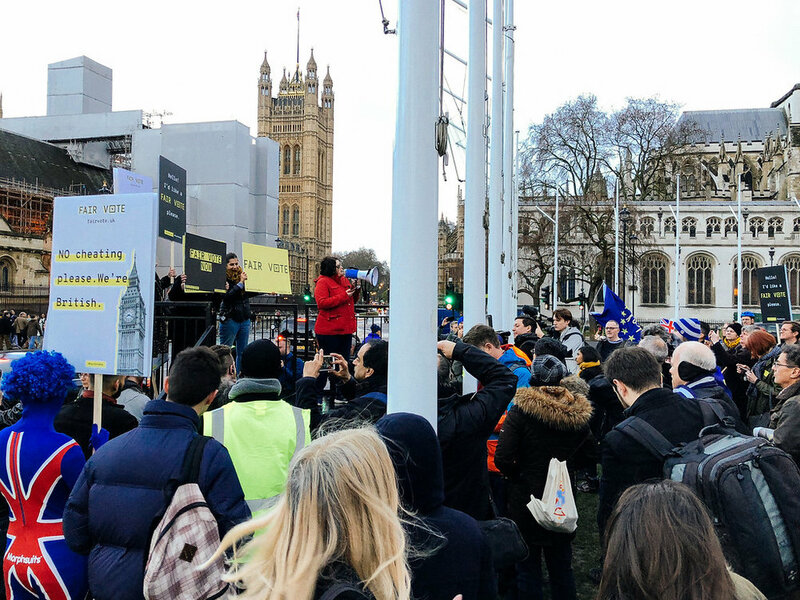 On Thursday 29 March Unlock Democracy's Director Alexandra Runswick spoke at the Fair Vote rally outside Parliament. This is what she had to say. Thanks to Fair Vote for inviting me to speak to you tonight and in particular to Chris and Shahmir for all you have done to bring these allegations to light. Unlock Democracy is a grassroots campaign for a democracy that puts power in the hands of the people. We have been campaigning to end the influence of big money on our politics for ten years now. Our supporters are split on Brexit, but united on the need to make our democracy fair. Let’s be clear. This isn’t about Brexit. It’s about the same old establishment elite hijacking democratic processes because they can. They have been exploiting loopholes in our electoral law for years. Not only do they have the resources, they are also faced with a government that is riddled with inertia. So what about if you cheat democracy? What then? May’s own party, for example, was fined an historic £70,000 by the Electoral Commission for breaking election spending rules in the 2015 General Election. Labour and the Liberal Democrats were also handed fines, albeit somewhat smaller. Sitting Conservative MP Craig Mackinlay will be facing criminal charges later this year regarding his election expenses. But when political parties spent a total of £41.6m in the 2017 General Election - £18.5m spent just by the Tories - a £70k fine could be considered cost effective and a price well worth paying. It’s basically small change. It’s easy to think that because we don’t have a culture of endemic bribery, that we don't have corruption; that because our institutions are old and established, and we have abolished rotten boroughs; that our democracy is strong and stable, to borrow a phrase from the Prime Minister. However if we look closely, we see that our politics, and the priorities of our political representatives, are often very skewed. What’s prioritised in that building doesn’t really reflect what people really want. Rather, it’s often the money pulled from the deep pockets of wealthy individuals and corporations that by and large - funds our elections, secures unparalleled levels of access and influence to policymakers, and that ultimately shapes the political agenda. What Chris and Shahmir exposed is that it’s really the same old establishment elite with deep pockets that are the puppet-masters of our politics. They can break the rules because they can afford to. These individuals and corporations are afforded significant influence over their respective parties and their policy agendas. This creates an imbalance in the representation of issues that matter to the majority of people versus issues that matter to a small number of elite individuals and private companies. Attendees from last’s years events programme including Boris Johnson, David Davis, Philip Hammond and Theresa May. You can dine with the highest profile ministers, including the Prime Minister herself. So long as the price is right. This is not a partisan point - most parties do this. For £5,000 you can join Labour’s ‘Chair’s Circle’ and get a chance to meet high profile Labour politicians. Now, there’s nothing wrong at all with wanting to make your views heard by politicians. But the problem with the system we currently have is that those with money can purchase access to those in power and influence over democratic processes. Most people simply don’t have £50,000 to spare so they can sit around a table with the most powerful members of the government, but does this make the problems they have any less worthy of being heard? Because in practice, if you’re not around the table then you’re on the menu, and the distorted policy priorities is largely due to the undue influence of those who can pay to play. For ten years we have been calling for an overhaul of the UK's outdated electoral laws, calls which have fallen on the deaf ears of successive governments. The Electoral Commission needs to be given greater investigatory powers and the ability to impose debilitating fines on those who seek to undermine democracy in the UK. There also needs to be low cap on the amount that can be donated to a political party. If there’s no meaningful deterrent for breaking campaign finance rules, and loopholes in the law are gaping wide and gameable by those with money, then our democracy is for sale. Keep up to date with our latest campaigns by signing up to our mailing list. For Vote Leave, "breaking electoral law may have been a price worth paying"